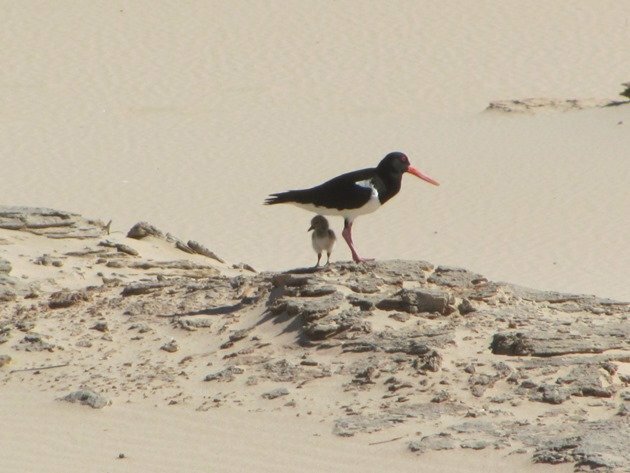 Our 23 kilometre stretch of beach that runs from Gantheaume Point to Willie Creek has finally seen the arrival of the first Pied Oystercatcher chicks for the 2016 breeding season. 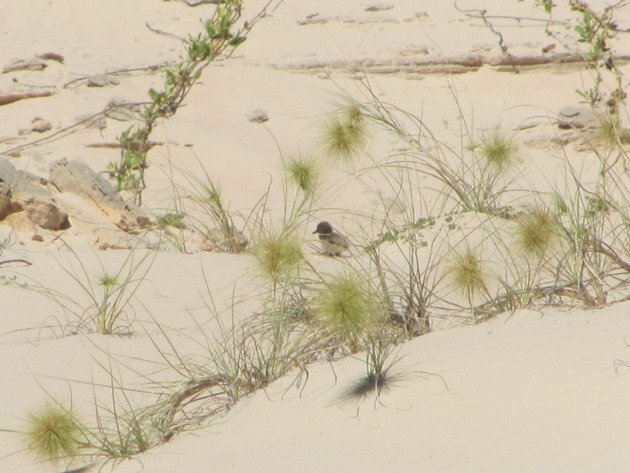 This pair of birds laid eggs in the first week of July, which is typical for the Broome area. 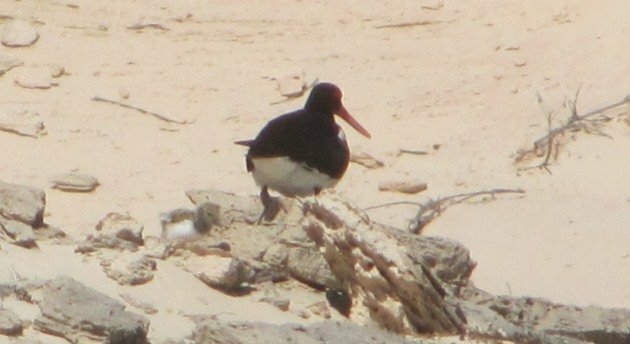 The next pair of Pied Oystercatchers to the north decided to lay earlier than normal this year and are currently sitting on their third clutch of eggs following predation of the first two clutches they laid. We checked the nest after the eggs were initially laid to establish how many eggs had been laid. We did not need a GPS coordinate, because this nest site has been used for many years. 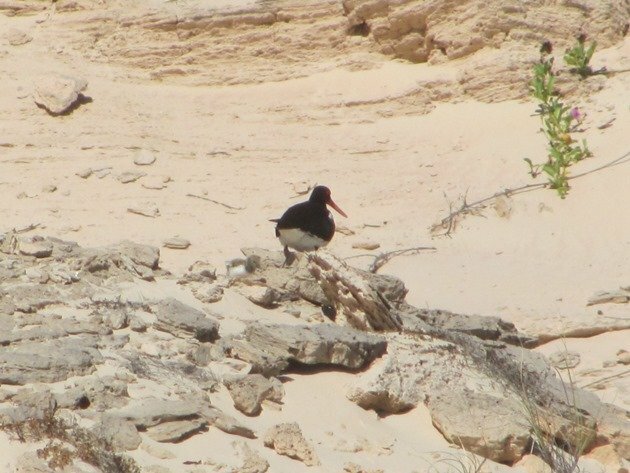 It has seen a change in partners and a female Pied Oystercatcher gave up this territory after a failed attempt with the current male bird, so we have established that they are not quite as faithful to their partners or territories as people may think! 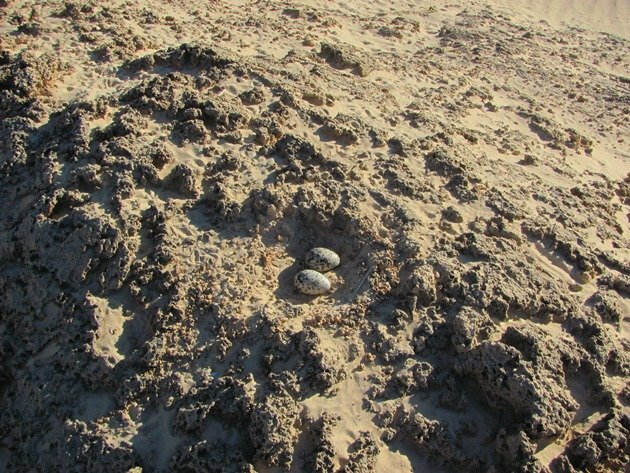 The above photo shows the nest site with its excellent views of the surrounding area and the photo below shows the eggs in the nest. 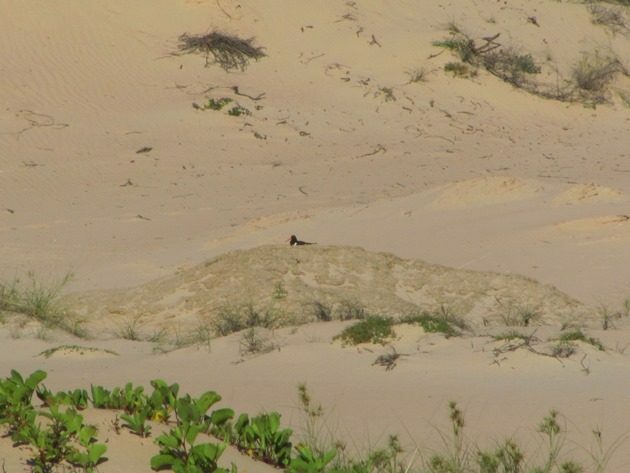 Pied Oystercatcher nests vary from a sand scrape to a rocky outcrop along this stretch of beach. Twenty eight days on and the eggs have hatched out! The female Pied Oystercatcher was guarding and sheltering the Pied Oystercatcher chicks when we visited two days after hatching and the egg shell had been removed from the nest. The chicks had been walked away from the nest area and the other adult was nearby at the water’s edge and would return instantly if there was an event that appeared dangerous. Prior to eggs hatching the Pied Oystercatchers are not generally vocal, but the arrival of chicks means they need to use their calls at all times. There are alarm calls and calming calls when a danger is no longer present and over the years we have learnt the variety of calls. 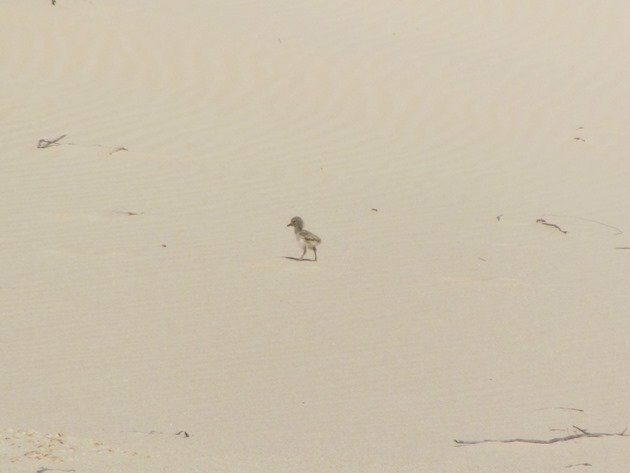 One of the Pied Oystercatcher chicks was a lot more active than the other and no doubt hatched out first and was ready to explore. 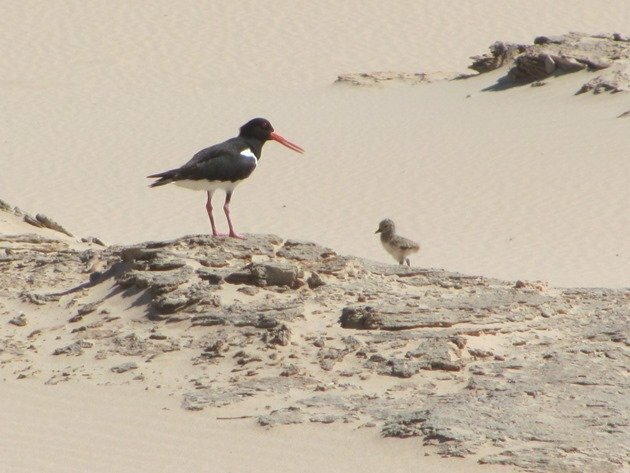 An adventurous Pied Oystercatcher chick! It was soon called to its parent and as you can see they are quite large and chunky even after they first hatch out! Shading under the adult Pied Oystercatcher! Sitting down to encourage the chick to get under a wing! There’s a chick in this picture! Maybe you can see the chick now! 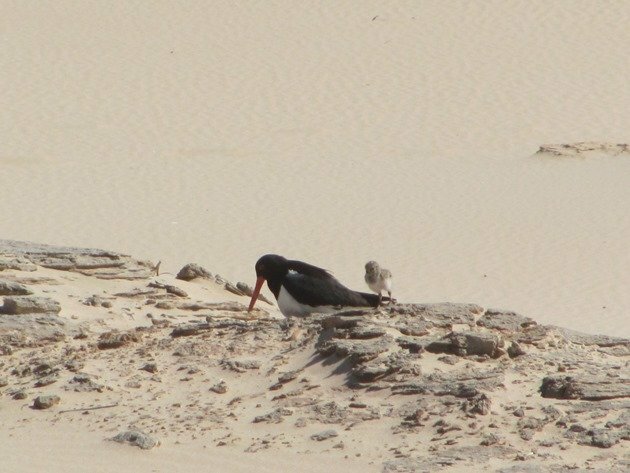 Sadly we don’t have high hopes for this Pied Oystercatcher family, because the predation of both eggs and chicks along the coast is so bad that we rarely see a single Pied Oystercatcher fledge from the sixteen pairs of Pied Oystercatchers that we monitor. That’s no reason to not share this special moment with you when our first eggs hatch out, though. Maybe they will have better luck this year! Those are beautiful photos of the chick exploring the world! I do hope it will survive this time. Sadly we have lost one of the 2 chicks already, so we hope the remaining chick follows its parents advice to keep well hidden when the raptors are about.